Jamshedpur: The 39th XLRI MAXI Fair, the annual disguised Market and Consumer Behaviour Research Fair conducted by the Marketing Association at XLRI (MAXI) concluded recently with great fanfare at XLRI- Xavier School of Management. The event was held on 13th and 14th January, 2018 at XLRI Campus, Jamshedpur. Coveted as one of the biggest marketing event in the B-school circuits, MAXI Fair, the mela-like event has been organized annually by the students of the Marketing Association of XLRI (MAXI) for the past 38 years to conduct consumer research. By collecting accurate and reliable customer data for the biggest names in the industry via digital games and contests, the students provide insights to corporates that are applied by the firms to improve live market products. With a 10,000-strong crowd descending upon the Fair-grounds from across the city of Jamshedpur across the two days of the Fair, companies would be hard-pressed to find a more willing target group of consumers to analyze. 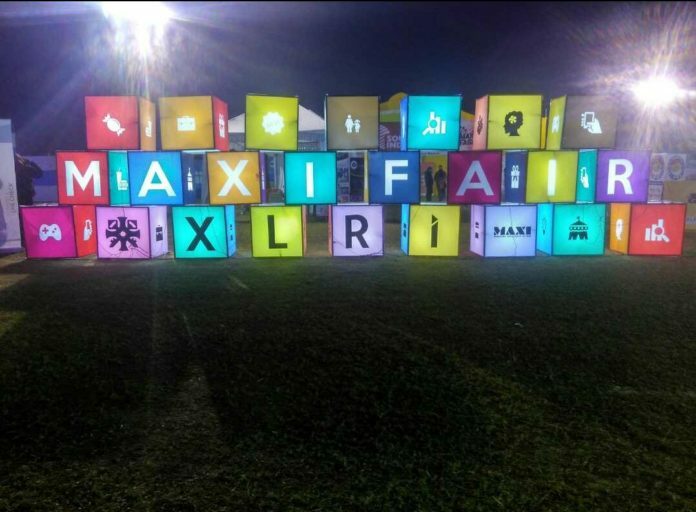 This year, MAXI Fair witnessed footfall exceeding 8000 mark. Across the two days various events were conducted like- Masterchef and Kids’ Fashion Show on the Day 1. While for the Fashion Show, parents flocked the fairground with their little fashionistas, Masterchef saw 8 home cooks battling it out on the fairground for the coveted title. Two new events were introduced this year at MAXI Fair 2018 – ‘Jamshedpur’s Favourite Family’ and ‘Healthy Jamshedpur, Happy Jamshedpur’ were held on the Day 2. Both the events were received enthusiastically by the citizens of the Steel City. ‘Healthy Jamshedpur Happy Jamshedpur’ event comprised of a Yoga, Zumba and fitness session. This early morning affair was well-attended by people of all age groups, showcasing the increasing health consciousness amongst the average Jamshedpur citizens. Art Attack drawing competition was organised for kids of the 5-15 age group, more than 150 little Picassos queuing up to showcase their prowess. With Classmate art supplies being used all across, the children brought out their imaginations with brilliant colours. Dance competition was also held for children at the event. The 80+ participants performed western and Indian dance form in solo or group performances. ‘Jamshedpur’s Favourite Family’ event had families unite and fight it out against other clans in a bid to win not just the title but also take away bumper offers like Tata Steel Pravesh Doors, washing machines, mobile handsets and the like. It was a one of a kind event where all three generations came together to stake a claim to the bounty. One of the biggest attractions of the two-day extravaganza was the comedy night by widely beloved comedian-actor-poet Shailesh Lodha of Taarak Mehta ka Oolta Chashma fame. Mr. Lodha had the crowd in splits with his relatable yet funny accounts of everyday life interspersed with thought-provoking poetry. With research partners such as FMCGs, auto companies and consumer healthcare giants lining up to be part of the Fair and reposing their faith in the effectiveness of this method of analyzing consumer behaviour, MAXI Fair 2018 is keeping up with the times by going digital. Be it the queueing system being used to send people to the gaming tent or even the games being used to collect data for the research problems, MAXI Fair continues to evolve and stand the test of time.